Seattle Laptop, The Laptop Experts! Over 50,000 Laptops Serviced! Customer Laptop Repair Information : Seattle Laptop has written some brief summaries below describing many of the more common types of laptop repairs we perform. We prefer our customers read the information below pertaining to their specific type of laptop problem, so they can become familiar with our repair processes. The more a customer understands about what we face when we attempt to solve their laptop problems the better it is for everyone involved. We truly enjoy educating our customers on laptop maintenance, and laptop care, and what may be involved in repairing their laptop if it does develop problems. Be sure to read our Laptop Maintenance document too! Customer Satisfaction : The Seattle Laptop Team promises to do everything we can to be sure our customer's laptop is fixed quickly, and properly the first time. We have been selling, and repairing laptops since 1996, and making sure our customers are extremely satisfied with our service is our number one goal. Experience Pays : Between the 50,000 plus customer's laptops we have repaired, and the tens of thousands we have sold in our store, and we have supported over the years, our Laptop Repair Technicians have seen just about every kind of laptop problem imaginable. We do such a large volume of laptop repairs that we see many similar laptops with exactly the same problem repeatedly. Since we do laptop system board repair, we find that quite often the same component fails on similar machines. We can many times quickly locate and repair the system board problem without spending much "diagnostic" time, since we know where to look for the problem. This saves our customers money, and time. Our laptop repair technicians do extensive research on laptop system board failures, and are capable of fixing almost any type of problem. Power Jack Repair Plus : We specialize in power jack, system board repair. We carry the power jacks in stock for most laptop models, and have the proper equipment for this type of system board repair. When a power jack breaks it can short out the system board, and damage it so just installing a new power jack will not fix a customer's laptop. We trace down the damaged components on the system board, repair them, and have an unmatched success rate on our power jack repairs. Macbook Repair : Our technicians specialize in the repair of Apple's Macbook computers. We have in stock a large quantity of common repair parts for Macbooks, and can in most cases diagnose and repair a Macbook fast. From broken screens, to liquid damagd logicboards we can help. We are "The Laptop Experts" and also "Macbook and Apple Experts" too. Laptop System Board Repair : A laptop's system board can fail for a number of reasons. 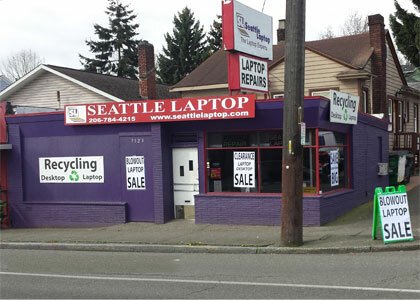 The technicians at Seattle Laptop can repair all types of system board problems. From liquid damage, to power surge damage. From "I dropped my laptop" to "I smell smoke" and so on. If you need your laptop, or your customer's laptop repaired, we can fix it!